Parrot's AR.Drone is an unmanned aerial vehicle (UAV) that uses Wi-Fi technology to connect to an iPad, iPhone or iPod Touch. The Parrot AR.Drone quadricopter is a toy packed with technology that is surprisingly stable and intuitive to fly. Yes, the Parrot AR.Drone is expensive, has mediocre battery life and becomes an out of control missile if used with any sort of wind. It also could be better equipped to deal with accidents. At the end of the day, this is a remote control chopper that you fly using your iPhone, iPad or iPod touch. And it's pretty damn cool. Every now and then we get a product in our test centre that attracts a gathering of jaw dropped onlookers. Parrot's AR.Drone — described as a "flying video game" — is one such product. The AR.Drone is a flying "quadricopter" that is controlled via an app specially designed for the iPad, iPhone and iPod Touch. Sound cool? It is! See photos of the Parrot AR.Drone in action. More information on the Parrot AR.Drone Australia launch. Technically, the Parrot AR.Drone is an unmanned aerial vehicle (UAV) that uses Wi-Fi technology to connect to an iPad, iPhone or iPod Touch where it can be piloted using augmented reality. In reality, it is a chopper with four blades that's controlled via a specially designed app for iOS devices. The Parrot AR.Drone generates its own Wi-Fi network on-board, without the need of an Internet connection or wireless router to get started. Set up is straightforward; simply insert the included battery into the AR.Drone, connect to its Wi-Fi network using your device and its ready to fly. You'll need a flat, stable surface for take off, as the AR.Drone utilises an ultrasound sensor to hover in mid-air when it is launched. The amount of tech included in the Drone is pretty amazing; it features two built-in cameras that stream live video, with the front-facing camera displays what the AR.Drone is seeing in front of it, and the bottom facing camera shows what is below it. The quadricopter is also fitted with an accelerometer and two gyrometers aiming to provide a smooth flight path. 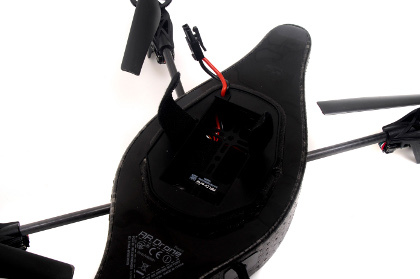 The battery housing is located at the centre of the AR.Drone; simply remove the hull to access it. The Parrot AR.Drone weighs less than 500 grams, can fly up to 18 kilometres per hour and can be controlled from up to 50 metres away. In addition to the regular Free Flight app, a third-party app called Flight Record ($5.99) is also available in the App Store, allowing the AR.Drone to record video while flying. Parrot also sells a multi-player game specifically developed for the AR.Drone called AR.Pursuit ($3.99), though you'll obviously need a friend and an extra AR.Drone to play. Once you've launched the app, and the AR.Drone has taken off, the flight of the quadricopter is controlled by moving a virtual joystick in the app and tilting the iPhone, iPad, or iPod touch from side to side using the built-in gyroscope. A second joystick steers the AR.Drone, and also raises and lowers its flight path. Controlling the quadricopter is definitely a steep learning curve; our first few flights ended abruptly by crashing into walls, ceilings and even people, but once you grasp its controls, the AR.Drone becomes relatively easy to manoeuvre and fly. You can easily switch between cameras in the app, and even bring up a picture-in-picture view of both cameras simultaneously. We were extremely impressed with the AR.Drone's stability indoors; if you don't touch any of the controls once it has taken off, the quadricopter simply hovers in mid-air, awaiting a command. Keep in mind that you'll need a rather large indoor area to fly the device properly. It is capable of manoeuvring down a narrow hallway, but the air the blades generate makes it difficult to remain stable.